Episode 1 was previewed at a screening at Shinjuku Milano 1 in Tokyo on December 26, 2013. Regular broadcasting began January 6, 2014. "It was inevitable!" - Oda Nobunaga. 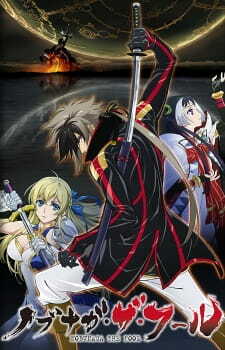 Nobunaga The Fool is a pleasant surprise of this season, a very curious yet enjoyable mix of many genres : Mecha, Sengoku Period, Sci-Fi, Fantasy & Romance, which may raise many brows given the unique sense of history of this anime, but that flamboyant extravagance has many charms, just like the main protagonist, Oda Nobunaga, a foolish and persistant man who aims to conquer heavens and earth as he is said to be the Savior-King by his allies, Jeanne d'Arc and Da Vinci. His resolve and potential steadily draws other characters to him, allies and enemies alike. Gaius Julius Caesar, King Arthur and many other notable historical figures make their entrance, while the internal strife of the Oda clan is at its peak. Nobunaga The Fool shows us foolishness, determination, betrayal, sacrifices, hope, and love. It appeals to our emotions and keeps the suspens till the very end. The well executed overall presentation manages to catch our attention with an impredictable conquest, a rich cast of voice actors, a beautifully handled animation and a very memorable soundtrack. The fast paced story, the intense interactions between the characters, the epic battle scenes, and the subsequent plot twists make it an anime you look forward to where it would take you. Nobunaga the Fool is a jack of all genres, master of none. It has an awesome premise—a reconstruction of Oda Nobunaga’s rise to power within a mecha-filled, pseudo-historical setting. Anachronism definitely has the potential to produce beautiful things (e.g. Gintama or Samurai Champloo), and going into this show, I was excited to see how its producers would handle a historical/mecha fusion. Now that I’ve completed it, I’m disappointed to say that it felt more like a disjointed mishmash of genres than a smooth blend. When I say that NtF was a mishmash of genres, I don’t just mean historical and mecha. It was often fantasy, occasionally supernatural, sometimes shounen, sporadically romance, and towards the end, sci-fi as well. Hence the comparison to a jack of all trades, master of none. NtF essentially gave itself too much to do. It had too many themes to neatly put together and ended up spending time focusing on different subjects without really combining them. There were magical evil imp children, melodramatic love triangles, power-ups with spirit dragons and cyborg limbs (I'm not even kidding), and so on. In the end, it was hard to tell what exactly the series was supposed to be about. My score is 5.9/10. Read below for the full review + rating breakdown. If you want to enjoy NtF, be ready to suspend your disbelief. The show is a war story takes place on two stars, east and west. The east star is dominated by Japanese warlords from the Sengoku period. The west star is dominated by random famous Europeans plus Chandra Gupta. (If you're a stickler for historical accuracy, you probably won't like this anime.) As you might guess, the allusions and references are all over the place. Here’s a small sample of the references made in NtF: Schrodinger’s cat, Excalibur, and Hercules—and that’s only in one episode. The topic for each episode is set by tarot cards. At some point in each ep, a new card is revealed (like Hanged Man or Empress), and the card signifies a character or event during that episode. It's generally predictable, but it does make the anime more entertaining. The idea is admittedly clever. Characters spend a lot of time fighting over regalia, which are mystical pendants that grant physics-defying upgrades to giant war armors (NtF's mechas). When activated, they draw from the power of ley lines and cause extra weapons to immediately materialize. Yeah...just roll with it. There's a prophecy that two kings will be born—a Savior King and a Destroyer King whose destinies are to save and destroy the world, respectively. The higher-ups on the west star believe that Arthur, an enigmatic and seemingly faceless man, is the Savior King. After Jeanne Kaguya d'Arc has premonitions of an east star warrior named Oda Nobunaga, she and Leonardo da Vinci defect to the east star to see if he's the actual Savior King. They join the Oda clan, and Jeanne goes into disguise as a page named Ranmaru. Nobunaga and co. then continue their efforts to unite heaven and earth. Or conquer the world. Whichever sounds better. The plot isn't too hard to follow, but it's still unnecessarily contrived. Things get especially confusing during the last few episodes. Warning: characters' personalities don't necessarily reflect those of their historical counterparts. (Don't expect Jeanne to be a badass warrior. You will be disappointed.) The names are just there for the sake of making characters look cooler. The east star warlords at least bear some resemblance to the figures on whom they're based, but the west star knights of the round table (which include members like Hannibal Barca and Alexander the Great, and are not to be confused with King Arthur’s other knights of the round table) show little to no evidence of historical context. Caesar says “veni, vidi, vici.” Cool. Hannibal and Charlemagne speak to each other in French. Nifty. That's all you really get, in terms of historical influence. You won't be getting any Fate/Zero sort of background info on the characters, either. Historical inaccuracy aside (Jeanne Kaguya d'Arc...really? I know she's supposed to be a pseudo-Mori Ranmaru and have ties to the east star, but come on), the characters at least have interesting, distinct personalities. The reason why I'm giving a 3 instead of a 1 or 2 is because the character types aren't any less than what you'd get from your average action anime. A lot of the supporting chars may be one-dimensional, but they're rarely boring. Moving on, the biggest qualm I have regarding characterization is that the main characters have these little tics and habits, and the show abuses the heck out of them. Mitsuhide flips his hair. Hideyoshi rubs his nose. Nobunaga adjusts his shirt sleeves. I've seen each of these happen at least once per episode. Why do I say they're abused? Habits are supposed to reflect a character's personality, not define it. The habits shown in NtF are extremely overstated and, for the most part, not special. Among other things, the issue with the habits highlights how static the characters are. Their most obvious traits are literally tiny habits. Quick note about development: the main characters do go through changes in their ambitions and temperaments, but the changes are often sudden and not sufficiently explained. You can tell a LOT of the animation budget went into the giant war armors, which are the only things that are CG. They look gorgeous, and fight scenes look amazing. Unfortunately, although the art is very good overall, the discrepancy between quality for giant war armors and everything else is pretty noticeable. The CG animation = 10, the rest = 7. Interesting thing I noticed: in the Owari setting, you see the same looped animation of this dude ringing a bell for every invasion scene. The only explanation is that the guy is secretly immortal and never rests, eats, or gets hurt even when his city is being attacked by laser beams. Additional props to Miyano Mamoru, Sugita Tomokazu, and Nakamura Yuichi for pulling off Nobunaga, da Vinci, and Caesar so well. The BGM is a mix of traditional and orchestral music. It fits the series well, but isn't exceptionally good. The most memorable tracks are the ones played during the more intense scenes; they're one of the things I like most about NtF. There are generally two kinds of anime that are difficult to follow. The first is the likes of classics such as Texhnolyze or Serial experiments Lain, where the show was intentionally made convoluted by the authors in order to leave interpretation up to the viewer. These are shows that are purposefully made with the assumption that the viewer must decipher the plot for a philosophical reason. The second type are shows that are convoluted not in order to convey anything special, but because the writers of the show have absolutely no idea what they are doing and couldn't write a good story to save their pathetic behinds. This anime is unfortunately the second type. It's actually kinda sad, because when watching it you can really see that the POTENTIAL for a good show is there, but it just isn't well written enough in any respect to be enjoyable. I found myself watching it to the end, hoping it would eventually get its act together, but it just never did. The problem here is this anime tried tossing far too many concepts into the story without paying attention to the quality of any of them. There is a hint of romance, but it is never well done enough to be interesting. There are many characters that seem engaging at first, but are never fleshed out enough or developed to grab your attention. More than half the characters motives for their involvement in the overall story are never even explained. The plot itself is a mess, going through far too many changes with never enough details for any of them to matter. There is no sense of wonder or suspense whatsoever. It throws in historical references, but all of them turned out to be excuses for poor writing and few of them were accurate. The action scenes are decent, but because it's hard to care about the overarching plot behind them they aren't interesting either. Nobunaga the Fool is like the Action-52 of anime. Tons of genres, tons of ideas, but none of them well done. A show like Nobunaga the Fool will make you look like a fool at first glance. The premise sounds absurd, not to mention foolish and the first episode stops nothing at all to make viewers ask themselves what is going on. What it offers is a mixture of historical figures ranging from Joan of Arc, Leonardo da Vinci, Da Vinci, King Author, among others. It doesn’t stop there however. Rather, it steps up one more stage and decides to make usage of mecha warfare in a world of the unknown. Nobunaga the Fool is the type of show where you’ll be watching it trying to escape a labyrinth. To venture into a show like Nobunaga the Fool will take an imaginative and open mind. While it seems absurd at first glance, one should acknowledge the creativity of the show. For instance, take a closer look at the setting. It’s divided into two halves, the West and East Star. Upon a closer glance, there’s conflicts in their world involving warfare. And as even a fool can guess, the show trifles by the idea of war as result of ideologies. But let’s go back to the basics. The show fuses together legendary historical figures, tosses in the mechanics of mecha, and empowers them in this bizarre setting. For what’s worth, we get fusion of a steampunk/historical setting. The characters involved in the show may seem to be related to their legendary ancestors. Yet, their similarities only seems to scratch its historical domain. Starting off, there’s a blur of reality as Jeanne Kaguya d’Arc (based off of the character ‘Joan of Arc’), is burned at a stake in a typical witch hunt endgame style. Then flash forward and we find out that she has a powerful object that can potentially influence the world. Not only that but she also has visions relating to the one individual that will save the world, also known as the Fool, Oda Nobunaga. Here’s where the fun comes in. Oda Nobunaga is exactly as his name states. Not only is he the titular character but he is literally portrayed as a fool with his brash personality. His actions and behavior will get people talking despite it being harmless, on occasions anyways. But looking carefully, Nobunaga is a man that’s difficult to understand. It’s not an understatement either since his character is a representation of The Fool card based off of the tarot legend. The tarot cards bring about a purpose that serves as a fortitude of each episode. But behind those cards lies a meaning that unlocks each episodes’ morality through imagery, perhaps relating to the true visage of our titular character. Nobunaga the Fool isn’t just about making a prophecy come true. Throughout the series, we see different sides of Nobunaga and Jeanne. Nobunaga for instance is portrayed as a hotheaded man that he seems to wear like a mask. Yet, we do see a different side of him when he is with those closer with others, such as his family like his sister Ichihime. Later on, Nobunaga’s relationship/partnership with Jeanne grows closer. It reaches to a point where he strives to protect her no matter what. At the apex, he puts his own life on the line to save hers. And as seemingly incompatible as the duo is at first, Jeanne herself also develops feelings throughout their journey. Originally, she questions herself whether it’s worthwhile to accompany Nobunaga. Later, there’s a 180 degree turn where she strives to help him no matter what. To point it in easier perspective, the duo becomes more than just partners in crime. There’s even instance of Jeanne seemingly question what she is to him. Unfortunately, the romance angle of the show is vague, with only sparkles towards the end. It fails to communicate that part of the message without a meaningful purpose in the first place. Figures and legends that historians have been studying for ages. Nobunaga the Fool is a collection of noticeable characters from various backgrounds. One character of notoriety is Leonardo da Vinci. In contrast to Nobunaga, he is a man of intelligence known for his inventions from the West. His role as a journeyman is to seek out truth. Rather than power, he strives for knowledge and acts as a guide. With Nobunaga are also two other companions known as Akechi Mitsuhide and Toyotomi Hideyoshi. They serves as his arms and legs during his travels and yes, they are based off of historical figures from Feudal Japan. And finally, we can’t forget about someone that longs for Nobunaga’s attention. Serving as a love interest, Himiko (the queen of Yamato) makes offers to Nobunaga in exchange for one simple thing: his love. But a show like this only demonstrates love with a cliche way. It’s more like a niche, a badly executed one if it tries to construct a Romeo & Juliet story. The lack of chemistry is apparently present and their only closeness seems to be their common interests. On other hand, Nobunaga’s chemistry with his family makes up much more of his character. In one later episode, it truly brings out Nobunaga’s visage behind the mask he is wearing as he shows his sincerity, rage, and regret. It’s hard to describe the style of Nobunaga the Fool. Absurd would be one of them for its package of colorful characters. Yet, the story itself does make sense later on when dangerous antagonists are thrown in and plot holes are formulated in Nobunaga and Jeanne’s quest. What stands between them is more than ideologies, but also weapons that can wipe them off the planet. The world this show takes place in has adapted the usage of mecha. Now, this comes with an odd mix because their world obviously has historical themes such as the shrines and temples. Nonetheless, mecha exist and stands for a testimony for being a superpower as a destructive ways of combat. The mecha are described as ‘sacred treasures’. Nobunaga pilots one of them which he nicknames “The Fool”. This doesn’t occur until after it’s unlocked by Jeanne with a little device known as the ‘regalia’. At that point, the show starts venturing off into a more sci-fi zone. Not only that but other characters also get their own mecha. It becomes absurd to a point of deconstruction where characters fight for affairs using these mecha devices despite having little to no experience prior. And here, I thought the taste of anachronism was weird. Artwork comes together clustered but that’s because the fusion of historical and science backgrounds added together in a mix. When you have that, it comes out as zany. Yet, most of the designs are solid in particular with the world class backgrounds. It’s creative and invites attention to questions for viewers behind its origins. This can also apply to the mecha with their innovative designs that gives them a menacing appearance. The action they demonstrate will draw in eyes for attention with rapid movements thanks to its artillery. The characters themselves also have a good balance of mixture with their designs. Nobunaga looks like a badass, he behaves like a badass, and technically, he is a badass. Other characters such as Da Vinci, Ichime, and Hideyoshi stays true to their consistent character designs to match the right persona. On the other hand, Jeanne is hard to take seriously. Despite being portrayed as a stunning beauty with her long blonde hair, curves, and figure, her character doesn’t match at all with the historical counterpart. It’s just too damn silly. Judgment of its soundtrack goes towards mostly for our characters’ voice mannerism since the show focuses a great deal to portray them individually. Of all the main characters, Nobunaga stands out the most with his commanding tone, intimidating nature, but also the same time a man heart of gold. However, others such as Himiko and Jeanne can come off as forceful with their voice mannerisms in particular during climatic scenes. On the other hand, background music has a decent degree of variances. It feels natural despite all the absurdity going on on occasions. The OP and ED songs also provide support for its moderate coordination with the OST. It’s easy to say that Nobunaga the Fool isn’t for everyone. Even if you’re a historian, this show will at times dance around with its gimmicks to a point of deconstruction. But looking closely, the show have some merits to its themes and style. It’ll take time to get used to it but some patience may pay off. On the other hand, be ready for some cliché and gags that can be hard to praise with everything thrown together. The story itself is also clustered with weak writing and uninteresting characterization when it comes to development. All in all, this show isn’t like reading a history book to get its message. Rather, it’s like a foolish textbook of literature taught by a professor of the coming ages.